Do you browse frequently on your Android device? Do, pop ups keep flooding your browser every now and then, ruining your browsing experience? Well not after reading this article. This How-to article includes the steps to disable the popup ads on your browser. Definitely popup ads are disturbing and we all agree to it, but the frustration doesn’t really end here. Not only are they intrusive, they are also heavy on the pocket for those who use a limited data plan. Browsing ample sites frequently loads the screen with popup ads. Well, it’s the right time to make these ads stop flooding your screen. There are no such techniques that can give you 100% relief from these popup ads. 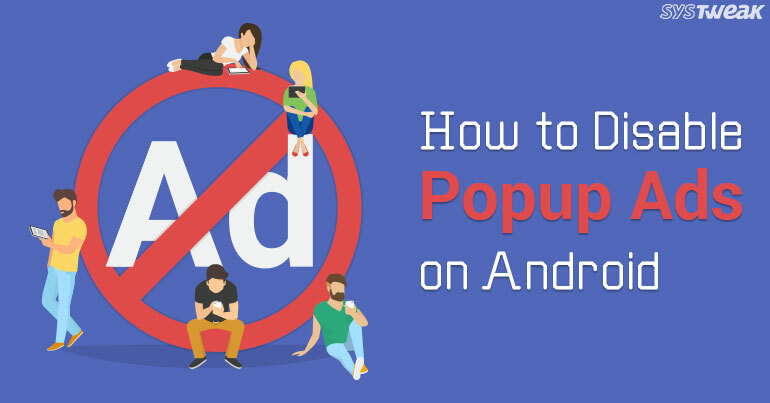 However, following some practices you can still manage to reduce the frustration keeping these ads away from the Android phone. Let’s have a look at them. Here’s how to disable popups on your smartphone. Launch Chrome browser on your Android device. Click on the More option, represented by three dots located on the top right corner of the screen. From the drop-down menu locate Settings and click on it to eliminate popup ads from your browser. Here, scroll down to locate Site Settings and then click on it. From Site Settings scroll down and locate Pop-Ups option. Click on it. Toggle off Pop-ups heading to disable popup ads on Android. That was pretty easy to do, isn’t it? However, if you do not wish to perform these steps manually, there are workarounds that may help. There are many third-party apps/add-ons available that can do the work for you. However, unlike web browser, the mobile version of Chrome browser for Android does not have the support of Plugins and extension which can do the task. An example of an add-on that can save you from these popups is Ghostery. Ghostery is a privacy browser that emphasize on blocking unnecessary pop ups thereby securing your privacy. For Android devices, Ghostery comes with a fully functional web browser. Below are the steps to disable popup ads on Android using Ghostery. Launch Ghostery browser on your Android device and then click on the three dots present on the top right corner of the screen. Here click on the gear icon and then navigate to Settings and then locate Block popups option. Toggle it on. You can also navigate to Ghostery > Tracker Blocking Options > Block Everything option, if you wish to restrict almost everything. Performing the above-mentioned steps will eliminate the annoying popups that over populate your browser. There are many other browsers available however, Ghostery is one such add-on that tops the list in blocking popups. Whether performing it manually or installing add-ons like Ghostery, these workarounds will definitely give users a sigh of relief from the frustration they face because of the annoying popup ads.